The Sino-Singapore Tianjin Eco-city seeks to address the challenge of sustainable development in a holistic and balanced manner, and this aim is underpinned by the concept of man living in harmony with his fellow man, with the economy and with the environment. This culminates in some distinguishing features of the Sino-Singapore Tianjin Eco-city: Energy Efficiency and Use of Clean, Renewable Energy The use of clean fuel and renewable energy such as solar energy and geothermal energy will be explored. For a start, the Eco-city will draw on waste heat from a major nearby power plant to provide district heating. Green Buildings All buildings in the Eco-city will conform to green building standards to ensure efficient energy usage. The use of clean and renewable energy, such as wind and solar energy, will be promoted in the Eco-city. An energy-conservation and environment-friendly mindset will also be cultivated in its residents. Green Transportation An efficient and easily accessible public transport system will be available, which will reduce the level of carbon emission within the Eco-city. Green trips, which include public transportation, cycling and walking, will also be promoted in the Eco-city. The target is for at least 90 per cent of the trips within the Eco-city to be via walking, cycling or use of public transport. Ecologically Friendly The development of the Eco-city will proceed in harmony with the natural environment. Existing wetlands and biodiversity will be preserved. Extensive greenery will be a distinctive feature of the Eco-city, with lush green spaces and recreational spaces sensitively interspersed throughout the city. Water Management Water recycling and more efficient use of water resources will be one of the key features in the Eco-city. The Eco-city is located in an area of low rainfall. Water from rivers flowing through the region will not be able to meet the needs of the Eco-city. To overcome this constraint and to reduce its reliance on external water sources, the Eco-City will draw a significant part of its water supply from non-traditional sources such as desalinated water and recycled domestic and industrial wastewater. To provide a quality living environment for residents, tap water will be potable and in line with PRC and international standards. Waste Management Integrated waste management will be implemented in the Eco-city, with particular emphasis on the “3Rs” of waste management – Reduce, Reuse and Recycle. The conservation of resources and reduction of waste generation will be encouraged through public education programmes. Where possible, non-organic waste will be recycled and reused, while organic waste will be used as biomass for energy. Economic Vibrancy The Eco-city aims to achieve economic vibrancy, by specialising in tertiary and service industries, being a educational and R&D centre for environment-related technologies, as well as being a destination for eco-themed recreational tours. It will also provide good employment opportunities for its residents, ensuring that the Eco-city remains economically viable. Social Harmony The Eco-city will place emphasis on the development and strengthening of social harmony among the residents. There will be subsidized public housing, so that people of different income and social strata can live near to and interact with one another. Communal amenities and facilities will be widely accessible. The Eco-City will also be barrier-free to cater to the needs of the elderly and the mobility-impaired. 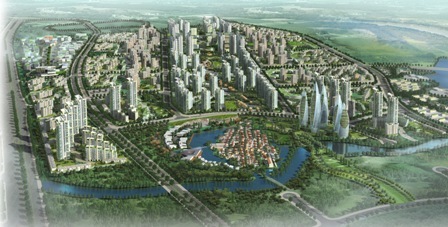 Heritage Conservation The development of the Eco-city will respect local heritage. The profile of the Ji Canal, a canal with 1,000 years of history, will be retained. Two existing villages within the Eco-city site, Qingtuozi and Wuqi, will be conserved through adaptive reuse or partial rebuilding. 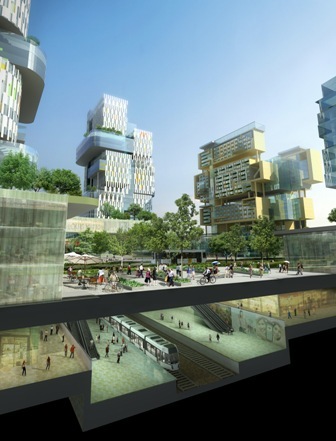 The winning competition project for the new city of Jingwu, Tianjin, China designed by the italian architect Joseph di Pasquale and his team: AM progetti from Milan. The city structure is ispired to Leonardo Da Vinci urban sketches and to Beijing Forbidden City urban structure. The central park and the main landmark building are inspired to the double seventh festival tradition. The eight central main towers design are inspired to the local kung fu hero philosophy and tradition.